All photos by Tony Lynch. 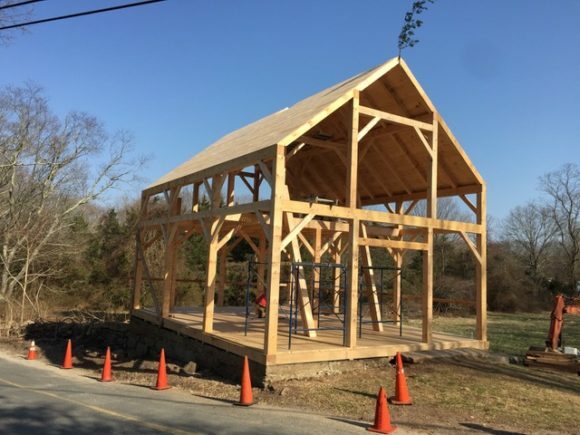 Back at the start of this month, many locals were sad to see the 300-year-old barn on the corner of Bill Hill Rd. and Burr Rd. on the Lyme-Old Lyme town border being demolished. 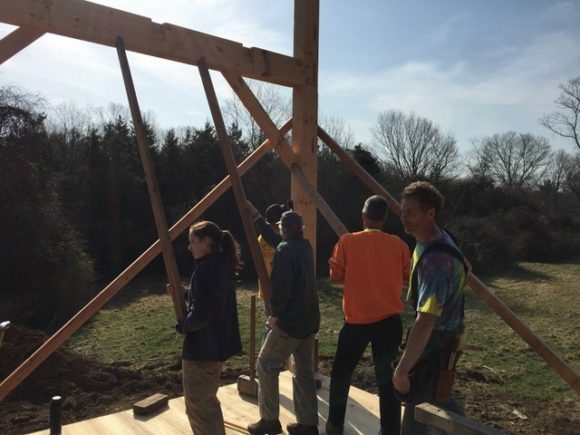 But come, Saturday, April 14, joy returned when it was reconstructed in situ by way of a traditional community barn-raising. The barn, along with two adjacent homes, were built circa 1717 as part of the Pierson farm of roughly 600 acres that straddled what is now the Lyme-Old Lyme border. 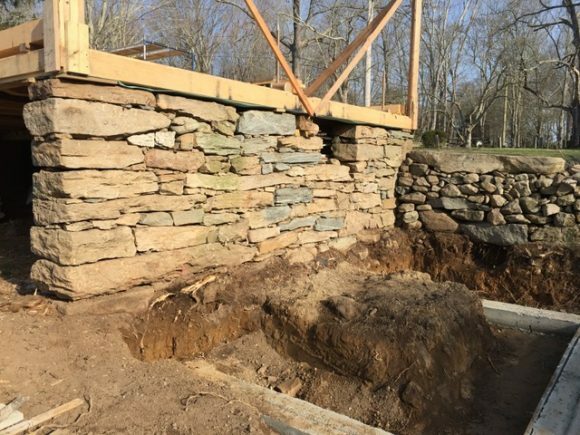 Sometime after Old Lyme was incorporated as a separate town from Lyme in 1855, the letter “L” was carved into the north side of the northwest corner of the barn foundation and “OL” was carved into the west side of the corner. 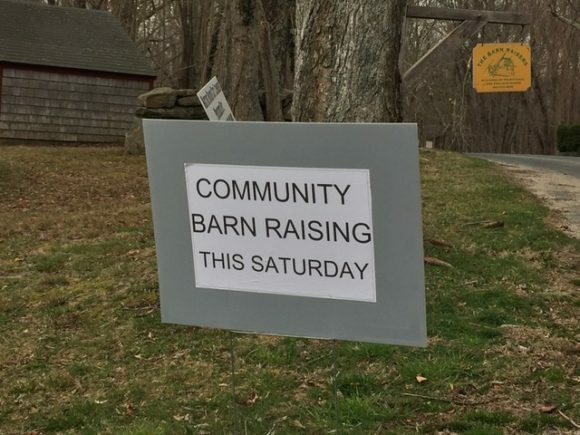 Most of the barn is in the current town of Old Lyme. The original barn is listed on connecticutbarns.org with an address of 39 Bill Hill Rd, Old Lyme, CT. The original barn was in danger of collapse when current owners, Enok and Leili Pedersen, recognizing that it was a treasure and local landmark, generously decided to rebuild it. 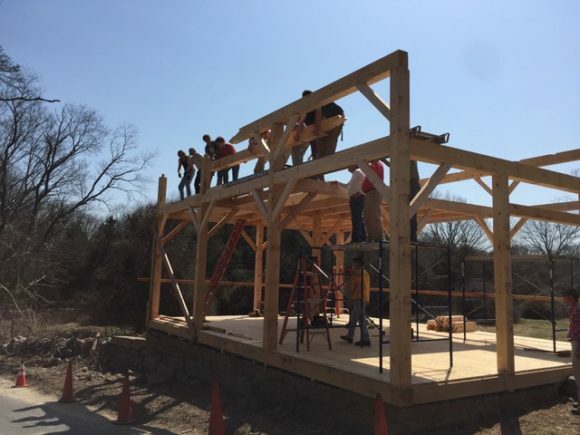 Brendan Matthews and his crew from The Barn Raisers of East Haddam, using native, rough cut lumber from Thompson Lumber of Hopkinton, Rhode Island, employed original methods to reconstruct the barn. 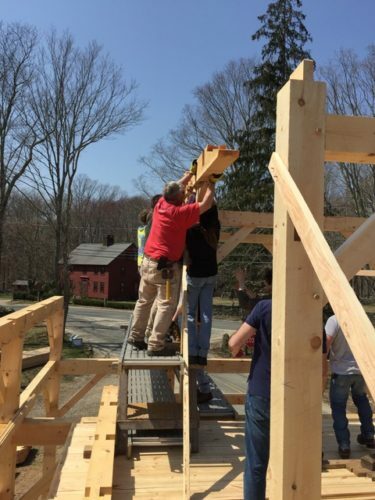 The mortise and tenon frame, held together with wooden pegs, was assembled on site and then erected by the professionals and about 30 volunteers from the community and surrounding towns. Several sections weighed nearly a ton each requiring everyone present to help raise and place them in position. 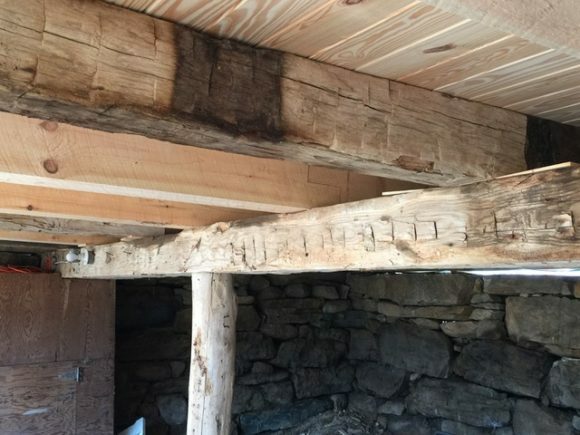 The barn was rebuilt on the original dry stone foundation and several original chestnut beams were incorporated into the new structure. The barn is very similar to the original in style, dimensions and construction, with the exception of the addition of a cupola and a few interior design modifications to suit the current owners. Notably, the barn is also the 100th traditional barn to be constructed by Matthews in his 25-year-career. Owners of previous barn projects joined in to raise this barn, including the owners of barns number 1, 6, 40, 80 and 87. 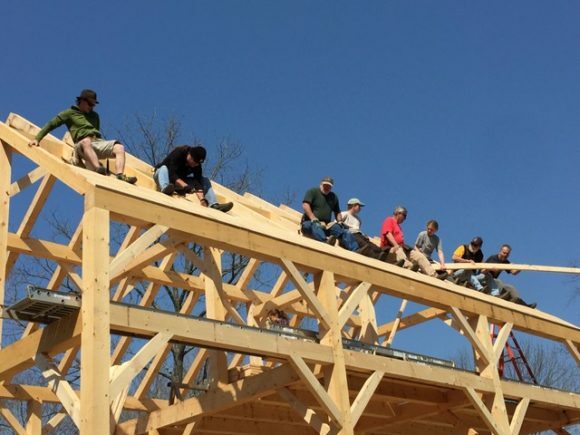 In the midst of an unusually cold, wet spring, the day of the barn-raising was auspiciously a cloudless, warm day, which made the event all the more enjoyable. 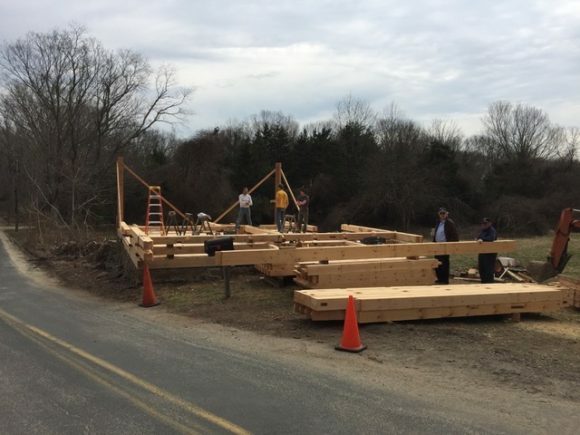 Lunch was provided, and the professionals and volunteers worked together from about 9 a.m. until close to 5 p.m., at which time the frame of the barn was complete and the roof and main floor boards were in place. A pine bough was fastened to the peak of the roof as a traditional finishing touch. At the end of a long but rewarding day, Matthews was presented with a celebratory cake to commemorate his 100th barn-raising and everyone who had participated in the barn-raising happily helped in its consumption.